Only a few days until Easter, and I still have a dinner to plan and Easter eggs to dye! 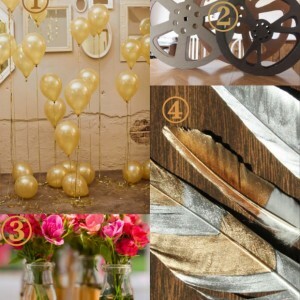 If you’re in a similar situation, here are some Easter ideas for how to projects. I hope some of these tips and tutorials will inspire you to create some last minute Easter goodness! Enjoy! Savory Leek & Mushroom Tart by Sand and Sisal. Cranberry Feta Chopped Salad and Crescent Roll Recipe by It’s Just Laine. 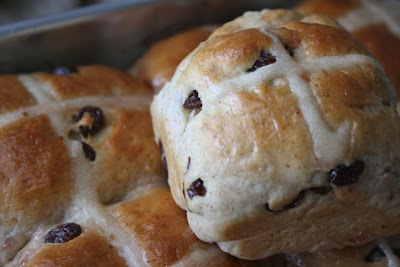 English Hot Cross Buns Recipe by The Traveling Spoon. 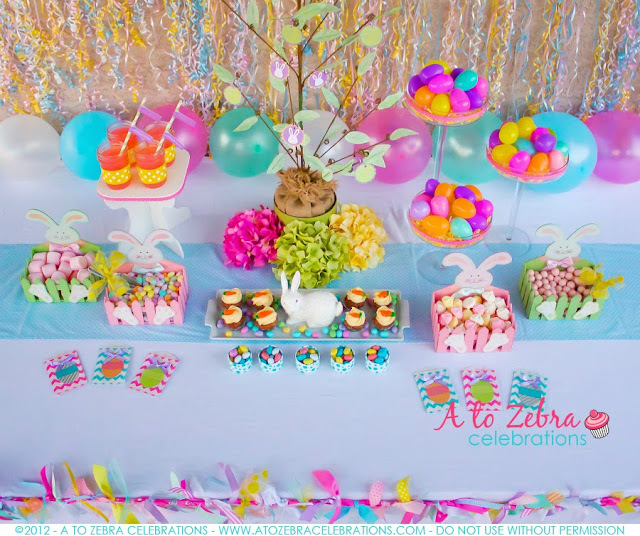 Easter Party Ideas on a Budget by A to Zebra Celebrations. Marshmallow Easter Kabobs by Echoes of Laugher. Blue Bunny Cupcakes by The Seven Year Cottage. DIY Chalkboard Tablecloth for tasting stations by A Thoughtful Place. How to Make Bunny Picks by Shaken Together. 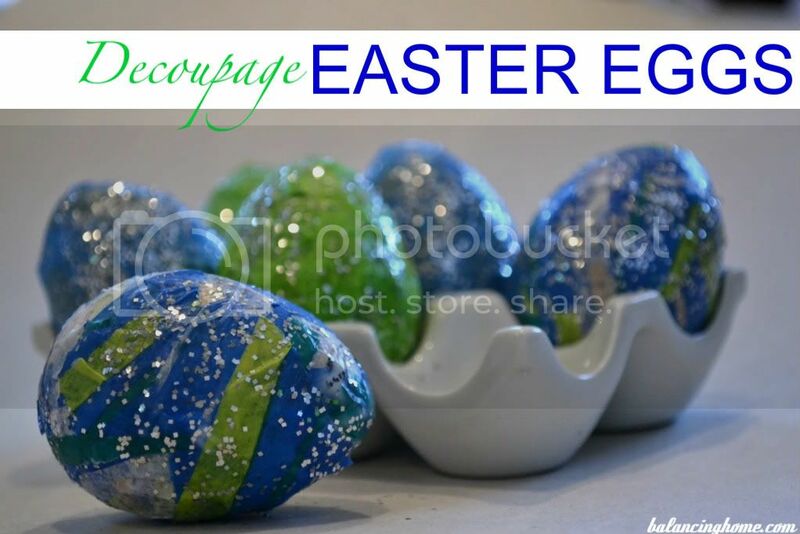 How to Decoupage Your Easter Eggs by Balancing Home. 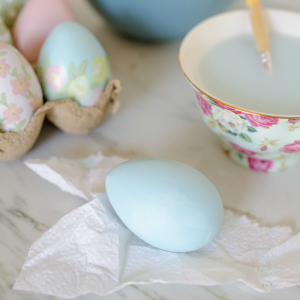 How to Dye Easter Eggs using Scraps of Silk by Teal and Lime. 20 Non-candy Easter Egg Stuffer Ideas by Mom on Timeout. 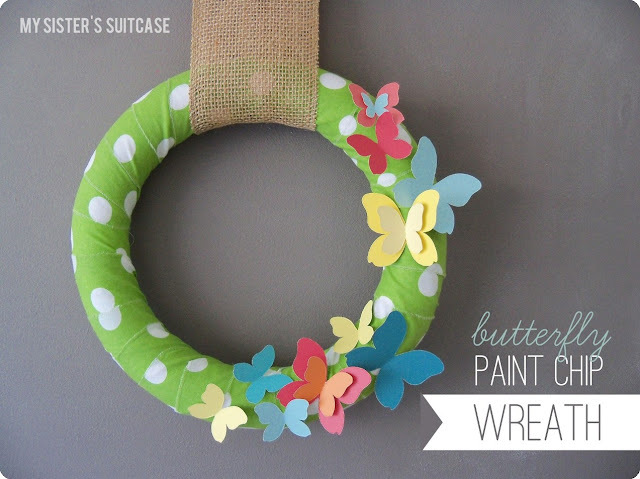 Butterfly Paint Chip Wreath by My Sister’s Suitcase. Live Camelia Wreath by Fairfield House. 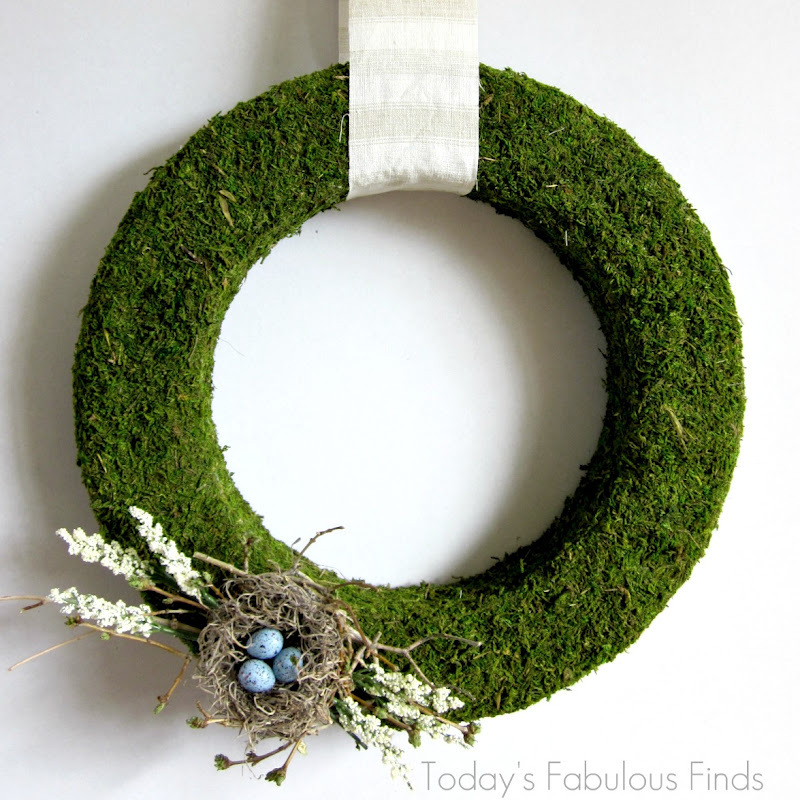 Spring Moss Wreath tutorial by Today’s Fabulous Finds. French Bunny Pillow Inspired by Ballard Designs by Confessions of a Plate Addict. 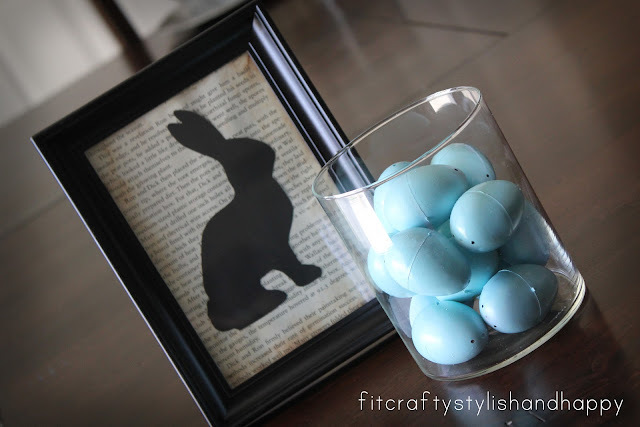 Bunny Silhouette Art by Fit, Crafty, Stylish & Happy. 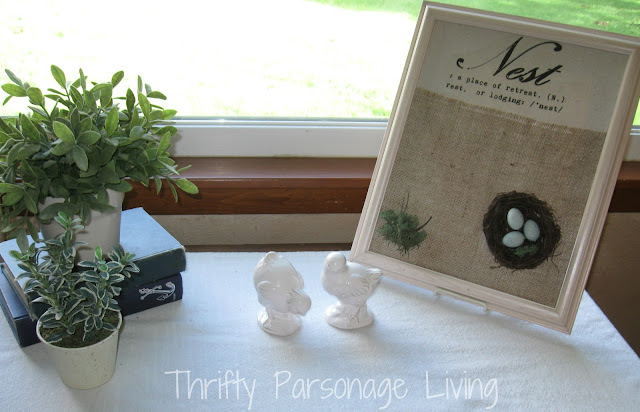 DIY Nest Framed Artwork by Thrifty Parsonage Living. Easter Mantel by Harrison Home. Spring Front Porch by Elegant Nest. Thanks to everyone who linked up! You made some excellent choices! I went and checked out a few of them. Hope you had a wonderful Easter! Wow! 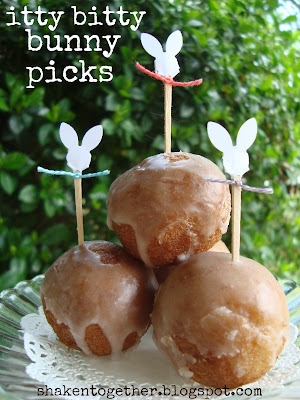 So many pretty Easter Ideas! Thanks for the feature! What a beautiful feature list, thanks for including my moss wreath! I hope you and your family have a wonderful Easter weekend! 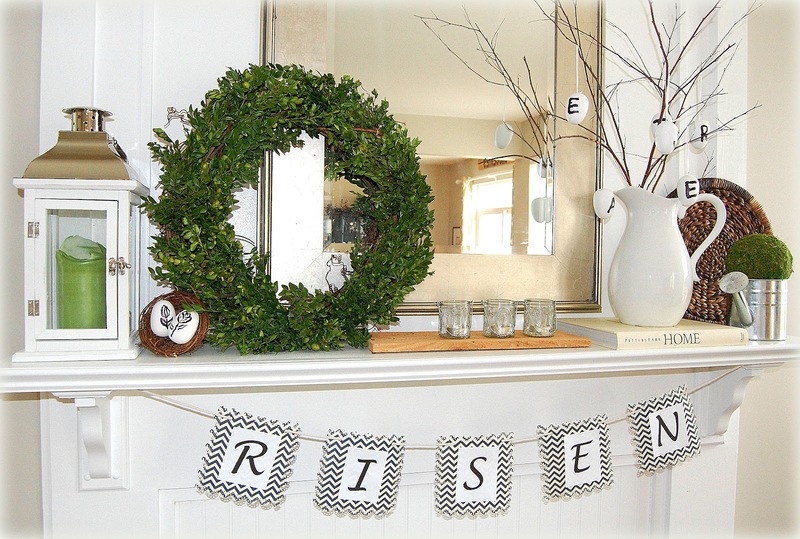 Thank you so much for featuring my Easter mantel! I am honored to be featured amoung such great inspiration! I love the spring moss wreath and bunny pillow! Can’t wait to check them all out! Happy Easter! Thank you very much for featuring my blue bunnies… have a wonderful day and weekend to come! Thanks for featuring my nest artwork! There are so many great projects and I’m honored to be featured. I love the bunny pillow and the chalkboard tablecloth. The food all looks so yummy! Have a great weekend and blessed Easter! Hi Beth…Thanks for featuring my Front Porch Bench make-over! Love that bunny pillow and I am planning on making that spinach cranberry feta salad for Easter brunch…yummy! Thank you for featuring my Camellia Wreath. It’s an honor to be recognized among so many talented and creative people! Wishing you and your family a blessed and happy Easter. Great projects! I love seeing the highlights of your parties. Happy Easter Beth! I LOVE that bunny pillow!